While I was appliqueing, the cart kept flirting with me as I caught glimpses of it out of the corner of my eye. The cart was right. I did want to look. The transformation was amazing! It had gone from a dirt and dust covered plant stand on the front porch to a Mad Men inspired bar cart for my husband. In contrast, the quilt hangs quietly on the wall, unassuming. But when my gaze lands on it, a warm fuzzy feeling flows through my body….the feeling of happiness. Both the bar cart and quilt exist because of me. If I had not conceived of the School Year Challenge back in August, I’m pretty sure neither of these projects would have gotten done. Never in my wildest dreams had I envisioned the bar cart as a bar cart. My husband, Douglas, and I discovered it at an antique mall on a family vacation to Missouri over a decade ago. In my mind’s eye, I could see it sitting on the front porch serving as both a table and a plant stand. I wanted it enough to convince Douglas we needed to overcome the challenge of figuring out how to get it in the backseat of the car with the luggage and our preteen son. The table did come home with us and sat on the porch. It served its purpose as a table but rarely had a plant on it. Over the years, the greenish color that drew my eye in the beginning slowly faded. 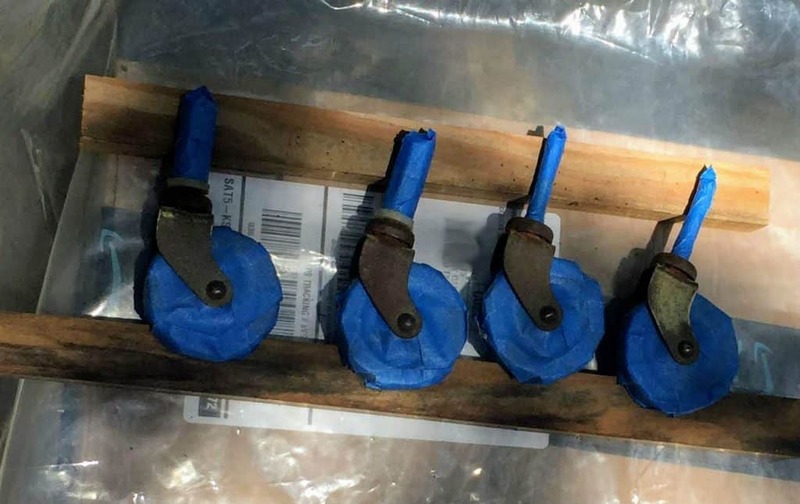 The metal parts of the cart gradually became covered with a layer of light rust. The glass surfaces weren’t fun to clean so they were usually coated in grime. The paint on the wood handles became cracked and weathered. The plant stand had been a bonus project for the School Year Challenge back in October but all I was able to get done was clean it. Plant stand in October after cleaning it. 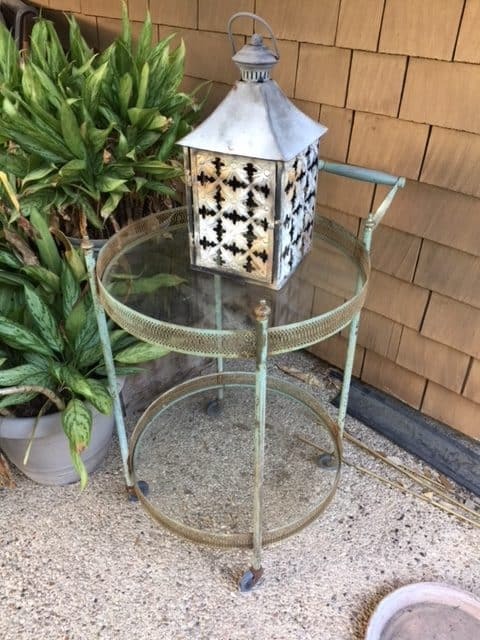 The plant stand which wanted to be mine years ago had become an eyesore and no longer talked to me. The time had come for it to be sold in a garage sale. Shortly after I had decided to get rid of the plant stand, I came across a blog post where the blogger shared ideas for a seasonal display on her bar cart. Her cart was two-tiered and had glass shelves…it reminded me of my plant stand. Still, I didn’t make the leap to envision MY plant stand as a bar cart. The light bulb came on one night when I was getting ready to cook dinner. I had to move the glass liquor decanter out of my way so I could use a larger portion of the countertop. The glass liquor decanter was a fairly recent addition to the countertop. It had been an inspired Christmas gift for Douglas since he is a Mad Men fan and likes a rum and coke after work. When I got it for him, where we would keep it really didn’t cross my mind. 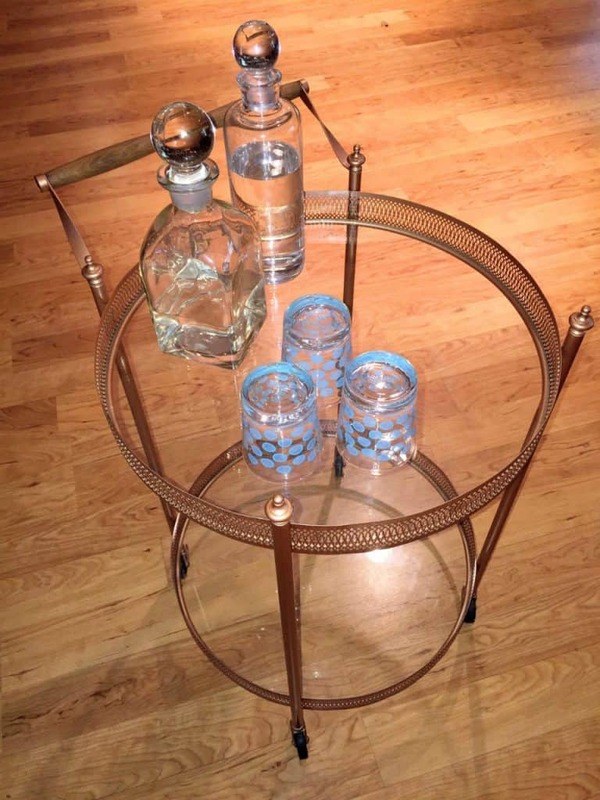 As I was moving the decanter out of my way, I had the big “ah-ha” moment…I could turn the plant stand into a bar cart! Any thought of getting rid of plant stand disappeared. Now all I could see was a finished bar cart in my mind’s eye and it was beautiful! It took a couple of weeks before I picked out a color. Neither Douglas or I really had a preference, so I went to Home Depot and stood in front of their spray painting display contemplating the colors. 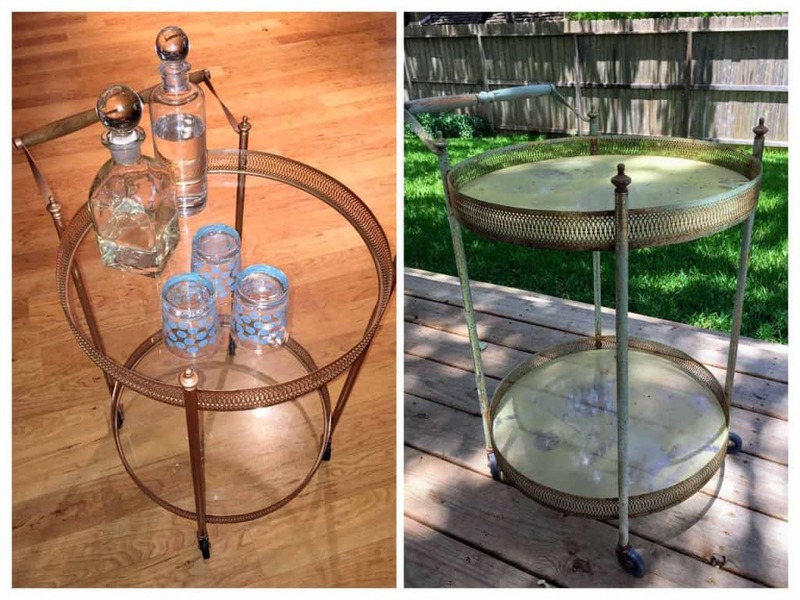 It took a couple more weeks before I decided to stop thinking about painting the plant stand and actually do the work to transform it into a bar cart. I tried a sanding block, wire brush and sandpaper to remove the paint and rust. 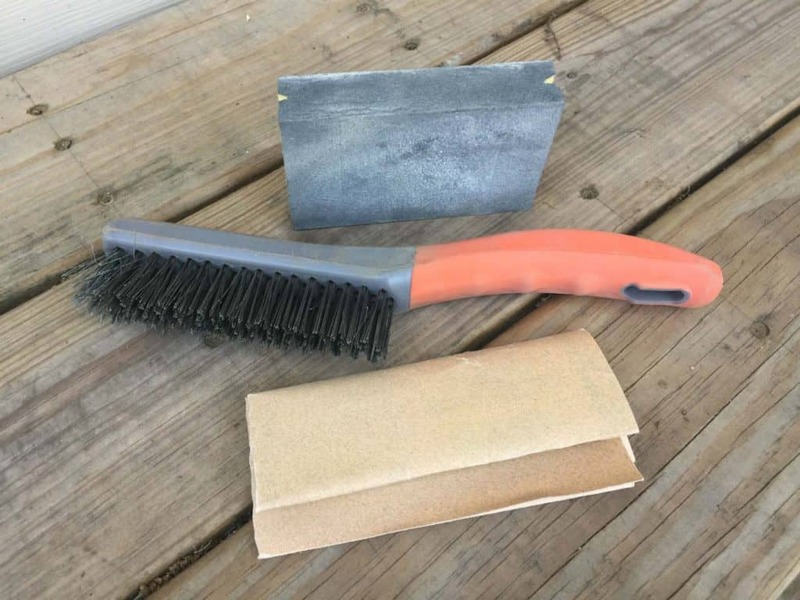 The sandpaper worked better because it was flexible. I didn’t worry too much about getting all the rust off since the cart would be inside and out of the elements. I just tried to get a smooth surface so the paint would adhere well. While sanding the table I discovered the handle came apart and I could separate the wood handles from the metal. 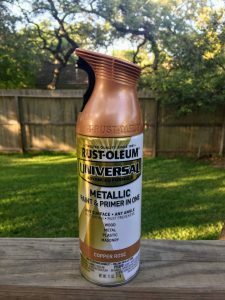 This would make staining the wood and spray painting the metal easy! The wheels were in bad shape but I couldn’t find replacements at the local hardware store. So, I washed them after I sanded the metal part. Painter’s tape was used to cover the wheels before painting the metal parts. 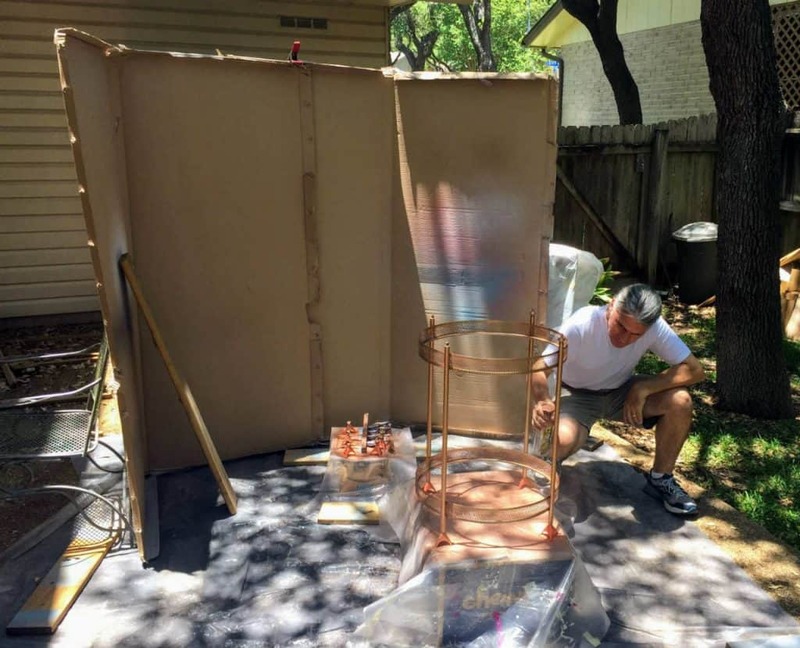 I set up the painting area in my backyard under the trees, elevated the wheels on a couple of pieces of wood, and used the HDX Painters’ Tripods from Home Depot to hold up the small metal pieces off the tarp. It was almost 100 degrees in the shade and the heat started getting to me. Douglas finished painting the table. 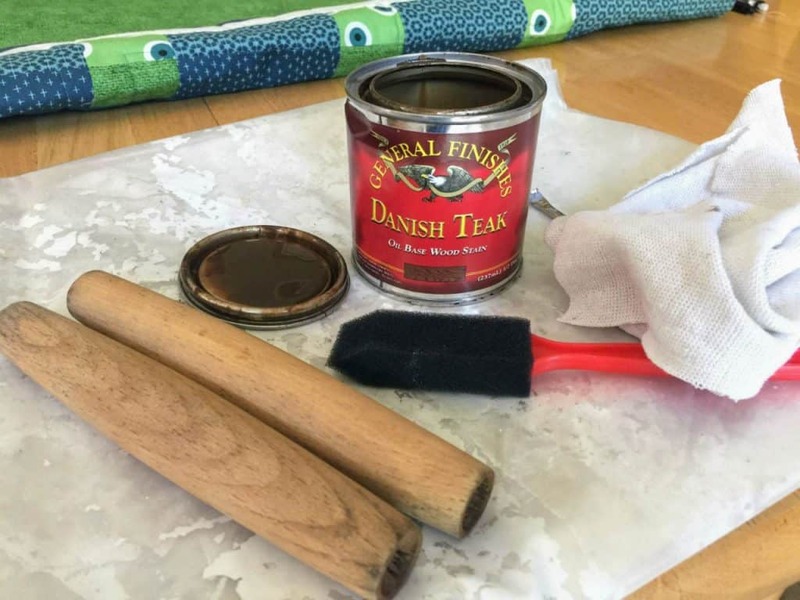 I stained the wooden handles with the same stain used on the hallway table and washed the glass shelves while everything dried. As soon as we put all the pieces together, we set the liquor decanters on the top shelf along with the glasses Douglas likes to use. That is right, decanters, plural. Douglas liked the decanter I got him for Christmas so much, we had to find him one for vodka! The bar cart is beautiful! The light from both sunlight and lamplight reflect off all the glass and make the bar cart glitter. The wooden handle is smooth to the touch and the entire piece seems to glow. You can’t hear the bar cart flirting with me, but you can definitely see the transformation! Making a quilt wasn’t even on my radar when I started the School Year Challenge in the fall of 2017. Surprisingly, this ended up being the last project I did! An impromptu Jeep road trip to see the fields of bluebonnets in South Texas one Saturday in April led to the discovery of Uptown Blanco Textile Studio, a charming quilt store in Blanco, TX. While talking with the store’s owner I found out there would be a beginning quilting class starting the third week of April. The discovery of the quilting store and learning about the class was the easy part. Making a decision to commit to 4 Saturday sessions (the length of the class) was more difficult even though this was something I had been thinking about for a long time. Each session of the class was scheduled to be 3 hours long. In addition, it would take approximately 45 minutes to drive each way from San Antonio to Blanco. So, I was looking at a commitment of five hours for four Saturdays in a row to participate in the class. 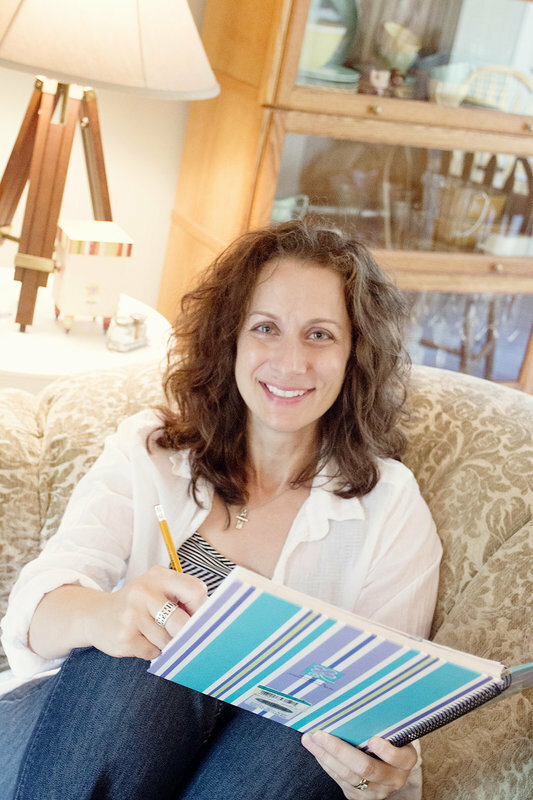 When I first started thinking about taking the quilting class, my thoughts were more negative and related to how much of a sacrifice it would be to give up five hours on a Saturday for multiple weeks in a row. Slowly, my mind drifted from the class being a hardship to the class being an opportunity of having a dedicated time to quilt. My thoughts became more positive and I realized there would be time designated each week to work through the process and at the end I would have a finished quilt. If I took the class, it wouldn’t be a sacrifice. Instead, it would be an opportunity. 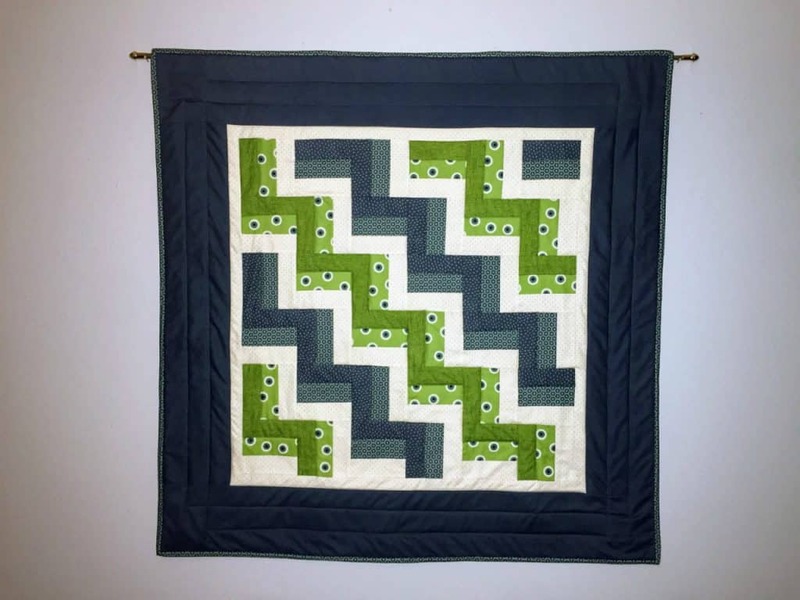 An opportunity to learn the parts of quilting I didn’t know, find out if there were more efficient ways in the quilt making process than what I already knew, and actually create a quilt from beginning to end. The quilting class took me from the very beginning of quilting to having a finished quilt. 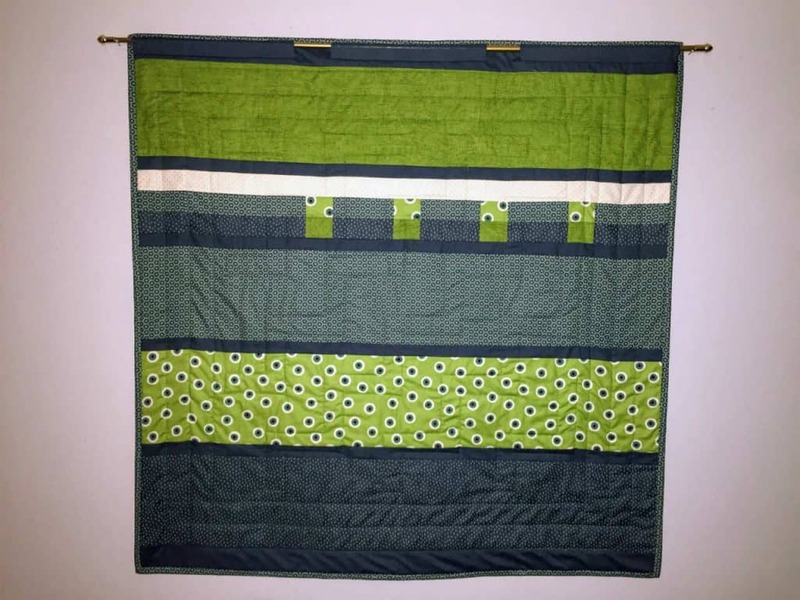 Quilting basics were covered such as fabric selection, strip sewing, rotary basics, arranging blocks, attaching borders, machine quilting, and binding. Tools, tips, and techniques were explained and modeled for each step in the process. Prior to starting the class I had some quilting knowledge and skills but I learned more than what I already knew. The time spent traveling, participating in class, and working at home doing my homework was definitely worth the new knowledge and skills gained! The finished quilt size is 42 x 42 inches and the block pattern is called Triple Rail Fence. I currently have it displayed as a wall hanging but when the weather cools off in the late fall, I’m planning on using it as a lap quilt. Instead of using one fabric for the back, I pieced together what I had left over from the yardage needed for the front which saved me money. I was even able to incorporate some of the remaining blocks from the front in the back. Can you see them? In order to meet certain financial goals, Douglas and I have been diligent with our household budget for nearly a year. For almost every month of the School Year Challenge we carefully considered how much we would designate to the project(s). May was the only month a budget wasn’t set prior to doing the projects. In fact, going into May, my thoughts were to finish up the wash tub and white table I didn’t do in March. I had already purchased all of the materials needed, so I didn’t think a budget was necessary. A few days into May I knew the bar cart and the quilt were the projects I wanted to get done. It didn’t make sense to stress out and try to find time to do the wash tub and/or the white table when I still had two more weeks for the quilting class and Douglas was really excited about the bar cart. The quilt class was almost $100 but it came with a $25 credit if I purchased the fabric at the quilt shop (which I did). May was the last month for the 2017-2018 School Year Challenge and I have mixed emotions about it ending. There is a touch of sadness the School Year Challenge has ended along with a feeling of anticipation for what the future holds. Along with those emotions are strong feelings of pride and success related to all I was able to accomplish during the School Year Challenge. In the 9 months of the 2017-2018 School Year Challenge I completed 23 projects and developed a variety of new knowledge and skills. More importantly, I stopped thinking, started doing, and created happiness! By setting up the School Year Challenge for myself and participating in a framework which included selecting projects, budgeting, planning, and executing the necessary steps to get the projects done, I’m motivated to keep going even though summer is here. There are many projects still on my list. Feelings of accomplishment are strong motivation to keep tackling ideas I can’t stop thinking about. Summer is here but my work is not done. I will continue to stop thinking, start doing, and create happiness!